It’s that time again. Here I am, slumped on the sofa, surrounded by tissues and reeking of Lemsip (or a competing supermarket own brand). It’s at dark times like this I wonder, what could I have done to prevent this sad state of affairs? Apparently the average adult catches 2-3 colds per year, so there are plenty of products out there claiming to prevent or hurry the demise of the inconsiderate little virus. There are also the traditional cures, including those your mum probably told you about – starving a fever and feeding a cold – whatever that means! Do any of them actually work? This is often promoted as a way to keep your immune system healthy but there is no evidence to suggest that it is any more beneficial than other fruit and veggies. Drinking the juice once you have a cold does make you feel better though – sugar rush! If you are taking a vitamin C supplement before and during your cold, you may shorten the duration of your cold. The manufacturer of the supplement claims that it is the world’s best known herb for supporting the body’s defence system. However, a review of research in 2006 by the Cochrane Collaboration (a network of scientists who evaluate medical research) found that taking Echinacea was no more effective than a placebo at preventing colds. There is one species of Echinacea, Purpurea, which was found to have some effect in shortening the duration of colds, although the evidence was not entirely conclusive. 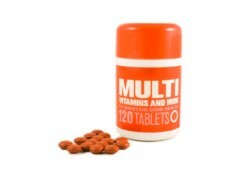 One study (accepted to be the only reasonably conclusive one) followed 225 men and women who took a probiotic multivitamin over two successive cold seasons. The result was that the participants taking the supplement got as many colds as those taking the placebo. However, those taking the supplement found that their colds were shorter by up to two days. They also suffered less from coughing and other symptoms. Makes your stomach feel lovely and warm and cheers you up a little, which may hasten the end of your cold! Apparently it traps the little blighter virus particles at the back of your nose and can be used to stop a cold becoming full-blown (excuse the pun!) In a trial most users noticed that their colds were reduced by one day in comparison with people using other cold relief products. So, if you use one or more of these products you may reduce your suffering by one or two days but as you probably already guessed, once the virus sets up camp in your nose, there is not much you can do but wait it out. Sorry. Some lovely little facts about colds…. The virus causing the common cold can only affect you if it gets directly into your nose. So unless you have let someone sneeze directly into your face on the bus or train, you have probably infected yourself with your own hands. If you are concerned about catching a cold this way, carry an antibacterial gel with you and make sure you use it before touching your face. The virus starts to get busy once it hits the back of your nose, with symptoms appearing within 12 hours. You will find the peak at 1 1/2 to 3 days, and symptoms are generally gone within a week. Viruses can survive on cold hard surfaces for up to 24 hours so don’t assume you’re safe if you haven’t been near someone who has a cold. 1. Begin treatment at the earliest sign of a cold. 2. Take a sustained-release, first-generation antihistamine (the kind that can make you drowsy) like diphenhydramine (Benadryl). Newer, non-sedating antihistamines like Ioratadine (Claritin) don’t appear to be as effective. 3. At the same time, take a nonsteroidal anti-inflammatory drug (NSAID), like aspirin or ibruprofen. 4. Continue taking the antihistamine and NSAID every 12 hours until the cold symptoms clear (3 to 7 days). 5. If your stuffy nose or cough doesn’t seem to be getting better, add an oral decongestant like pseudoephedrine (Sudafed) and a cough suppressant like dextromethorphan, or DM (Robitussin Cough DM). 6. If you feel worse or no better after 7 to 10 days, see your doctor. You may have developed a bacterial infection. This entry was posted in Female Health, Male Health, News and tagged cold prevention, colds, cures, echinacea, multivitamins, virus, vitamin C by Editor. Bookmark the permalink.